Yacht mattresses are generally installed with a 6 mm thick air mesh on the bottom side of the fabric cover. Where the mattress rests with its open cavities against the ship’s side, this mesh is continued upwards to the zipper for better ventilation! Since the slatted frame is already integrated in the cold foam through the spring elements made of plastic, the Flexima can be placed directly on a closed surface (wood, fibreglass). Nevertheless, you can enjoy great spring comfort, and humidity (heat) will be pumped out of the side of the mattress with each movement. Even if a Flexima has become truly wet due to high humidity, it will dry quickly thanks to the perfect ventilation system. To provide reliable price information, we need the maximum width of the mattress including side slopes and an indication as to with how many parts the mattress should be made. 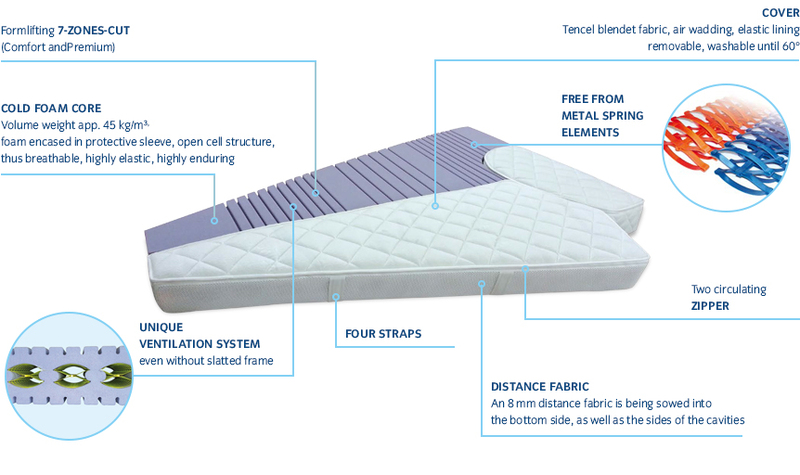 A thicker mattress brings a higher comfort level through more adaptability. An additional soft topper creates pleasantly soft sleeping comfort on firm mattresses. 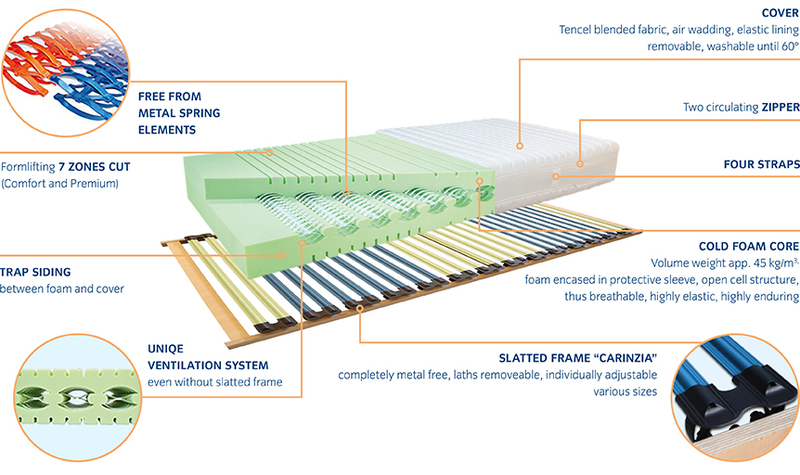 With every move made on a FLEXIMA, humid and warm air is pumped through cavities and out of the mattress core, while simultaneously fresh air is drawn in. This way, an optimal sleeping climate is regulated automatically. There is no heat build-up, humidity and bacteria don’t have the slightest chance. Incomparable comfort and thus a healthy sleep are guaranteed, which optimally solves back problems. 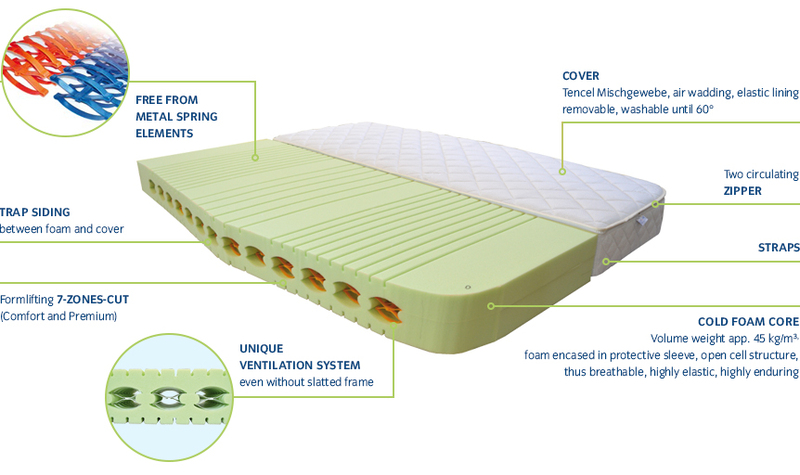 Every move made on a Flexima pumps humid and warm air through cavities and out of the mattress core, while simultaneously fresh air is drawn in. This way, an optimal sleeping climate is regulated automatically. There is no heat build-up, humidity and bacteria don’t have the slightest chance. Incomparable comfort and thus a healthy sleep are guaranteed, which optimally solves back problems. We manufacture any mattress based on a drawing or template. You can also take advantage of our “just-in-time” service to deadlines; within a few hours we will have taken measurements and made your personal Flexima. For reliable price information, we need the maximum width of the mattress and an indication as to with how many parts the mattress needs to be manufactured.